TREES AND US: More in Common Than You Might Think! 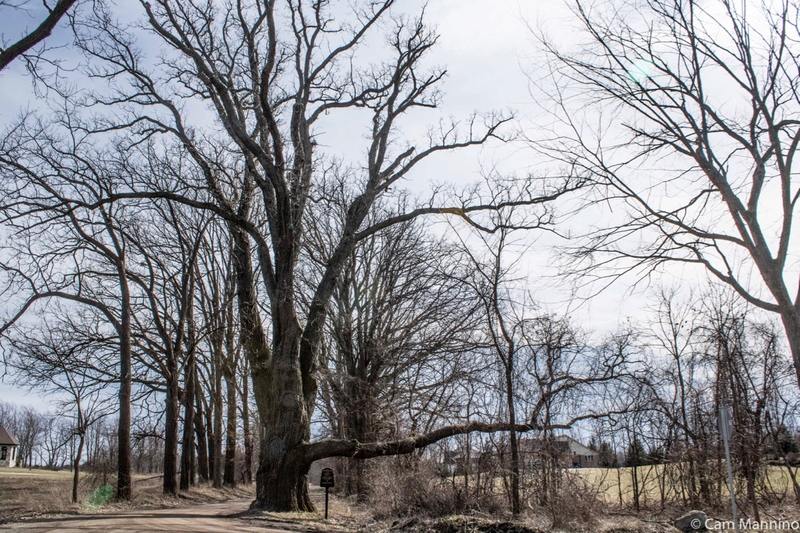 The Schuette Oak may be 500 years old. It was named to the Champion Trees National Register in 1973. The Schuette Oak has been living at the corner of Letts Road and Rush Road for probably 500 years. In 1973, it was recognized in the Champion Trees National Register. 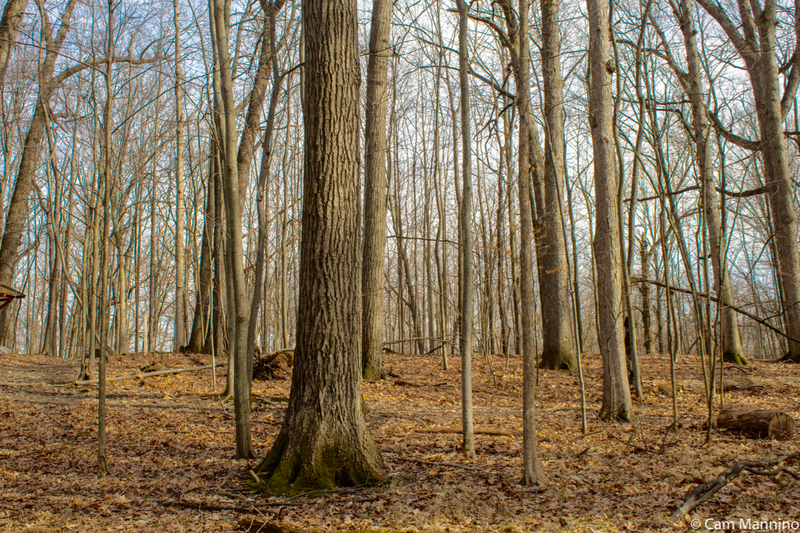 I spent many of my childhood summers sitting in a huge, very old tree – in my case, a sugar maple – in the field next to my parent’s house on Lake George Road. Held in its woody embrace, I read books, ate snacks, sang and watched tall field grasses dance in the wind. So when I came across The Hidden Life of Trees by Peter Wohlleben, I grabbed it and have enjoyed what this German forester had to teach me. So here’s a baker’s dozen of interesting facts about these giants of the plant world. Here’s hoping that you’re as surprised and delighted by some of them as I was. MOST TREES ARE UNIQUE INDIVIDUALS. Like us humans, trees mostly reproduce sexually through sperm and egg – carried in the pollen and and ovary of plants (one exception is vegetative reproduction through suckering in trees like aspens and black locust, a kind of cloning to make offspring that have the same genes as the parent). Each of those trees, like each of us, have a unique set of chromosomes. 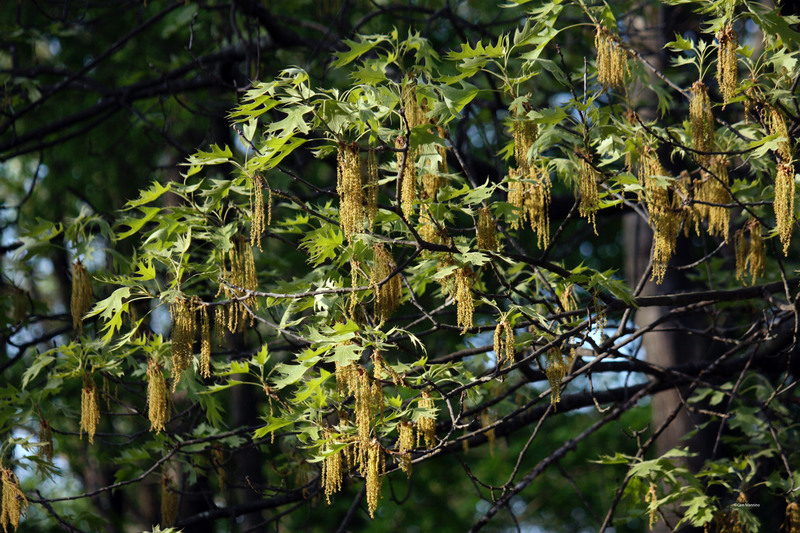 The pollen of oaks, for instance, is carried on the wind, bringing sperm to fertilize the eggs of other oaks. One advantage of reproducing sexually with pollen from another plant is greater genetic diversity of offspring. Differences in genetic makeup may help some individual trees better resist the challenges of plant life – disease, insects, drought or a warming climate. That creates a greater likelihood the at least some individuals of a species will survive even if the rest of the forest doesn’t. A hopeful thought. 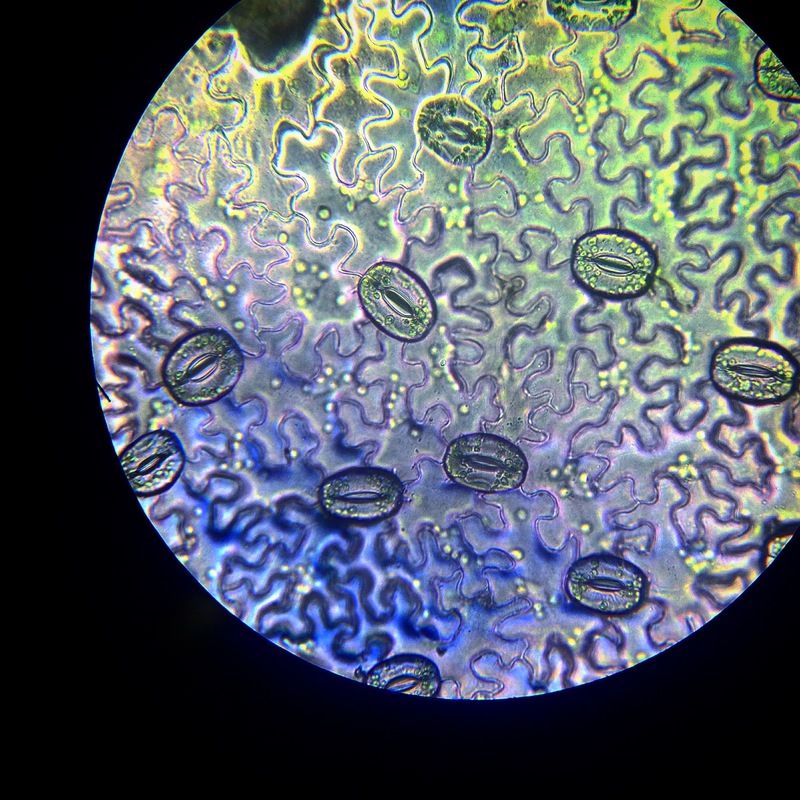 Trees, like all plants, have pores, not visible to the naked eye, on the underside of their leaves called “stomata.” Trees breathe in carbon dioxide (CO2) and breathe out (“transpire”) oxygen gas and water vapor through these pores. In pine trees, stomata are on the underside of their needles and sunken below the surface of the needle, helping reduce water loss when the air is very dry in the winter. Thanks goodness trees and plants do this! We need that oxygen and of course, we return the favor by taking in oxygen and transpiring CO2. Tiny holes on the bottom of leaves, not seen by the naked eye, are the “mouths” of the trees, called “stomata.” All plants have them. As explained in a February “Photo of the the Week,” mychorrhizal fungi wrap around tree roots creating a “wood-wide web” of amazing density beneath the forest floor. According to Wohlleben, “One teaspoon of forest soil contains many miles of … ‘hyphae’ ” – the microscopically thin filaments of fungi in the web. This fungal network provides a way for trees to feed sugars to their young, which we call saplings. Occasionally large trees feed other needy trees in the forest, those in too much shade, for example – thereby creating a healthier tree community. This mature oak is probably feeding the four little saplings around it through the “wood-wide web” of mychorrhizal fungi at its roots. WHEN ATTACKED BY INSECTS, SOME TREES WARN THEIR FELLOW TREES. 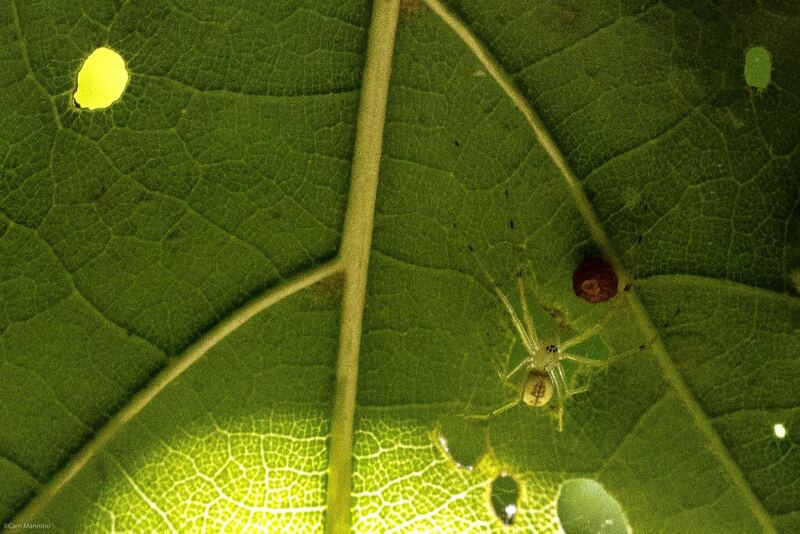 Using chemicals released through the “wood-wide web,” trees notify other trees when under attack. This allows their tree neighbors to increase the chemicals in their leaves to repel the invading insects. An oak, for example can increase the tannin levels in its leaves. Scientist have found that the tannin is either toxic to insects or perhaps just makes the leaves taste bad. Some trees can also release a scent that attracts the specific predator that preys on that particular insect. Clever, eh? This maze of tunnels is the result of an attack of bark beetles (subfamily Scolytinae), which tend to attack weak trees, but luckily, mostly dead ones. SOME TREES SYNCHRONIZE THEIR NUT PRODUCTION…SOMEHOW. Oaks and Beeches, for instance, somehow coordinate the years in which they will produce a huge number of fruits (acorns for oaks and beech nuts for beeches). 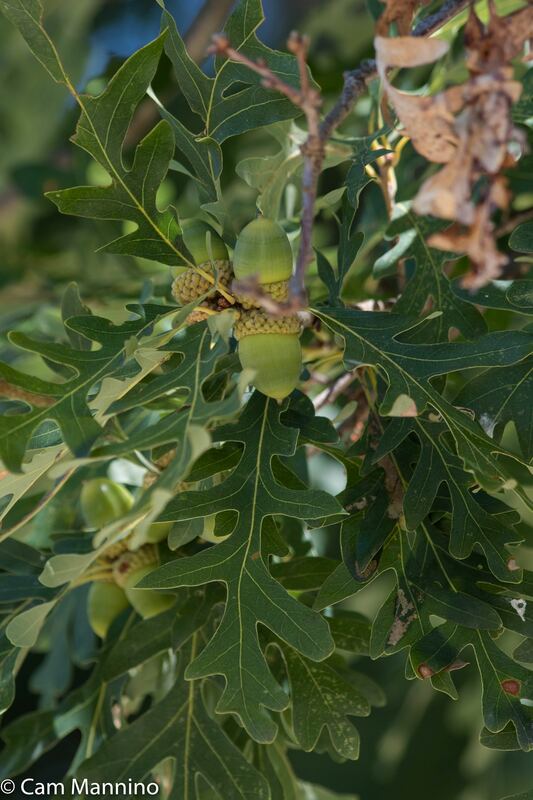 These are called “mast years.” In normal years oaks will only produce a few acorns, limiting the populations of deer, blue jays, squirrels, mice and other animals who love the fatty oil in acorns. Animals will eat most of the acorns in the off years, limiting establishment of new saplings. In mast years, however, the volume of acorns is so high that these animals can’t eat them all. So inevitably more survive to grow into saplings. It’s a nifty way to insure that at least some of your offspring survive in a world where, on average, each tree only has one “child” that reaches adulthood! Scientists don’t seem to know exactly how trees synchronize for mast years, although weather and seed production in previous years probably play a role. Acorns in the White Oak family – Burr Oak (Quercus macrocarpa), I believe. 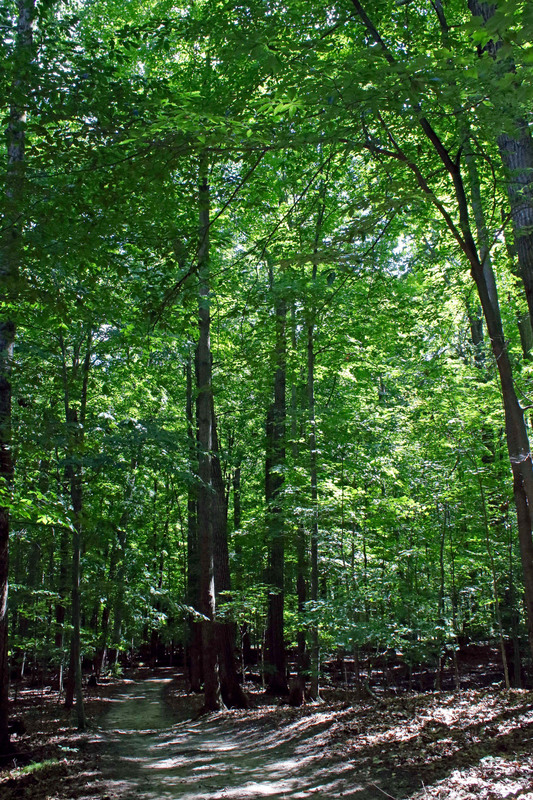 TREES DON’T MOVE (OF COURSE) – BUT FORESTS DO. As glaciers advanced and retreated during ice ages, forests had to adapt. Trees like Maples (genus Acer) sent their seeds flying on little wings, called “samaras,” or what children call “helicopters.” If the climate warmed, the samaras that flew north were more likely to thrive and start new forests, while the ones that flew south did better as the glaciers advanced. In this way, over thousands of years, whole forests migrated. Jays and their relatives, fond of nutritious acorns, are credited with helping oaks in southern Europe rapidly re-populate after the ice age. Today, the roads, houses, and lawns of human development have fragmented forests, limiting their movement and potentially hurting their ability to respond and move in response to changing climate. 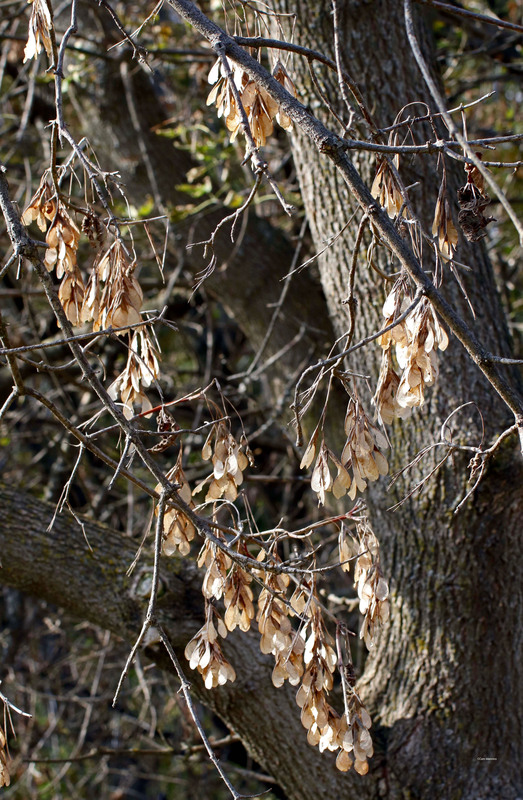 The samaras, flying seeds, of a Box Elder (Acer negundo), a member of the Maple family. We all know bears, raccoons, woodchucks etc., fatten themselves up before winter hibernation. Trees do something similar. Leaves use photosynthesis to capture the light energy from the sun and convert it to chemical energy stored in sugars. Throughout the summer trees store these sugars in their branches, trunk, and roots. As days get shorter and colder, trees begin to move nutrients out of their leaves in preparation for winter, breaking down the chlorophyll (which makes them green) into its components so it can be sent back out in the spring to the new leaves. 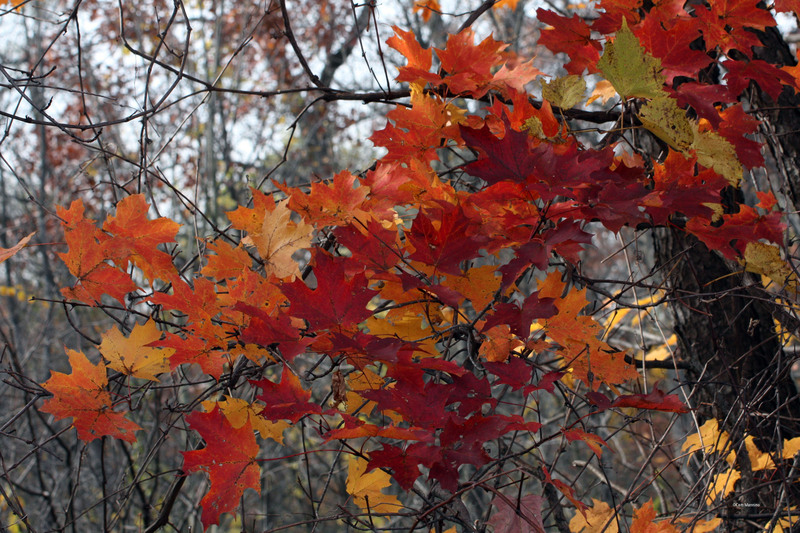 Once these green pigments are gone, the leaves turn the color of the remaining yellow and red pigments. As a final step before dropping their leaves, trees produce a layer of cells that seal off the connection between the leaves and twigs – and the leaves ride the next breeze to the ground. Trees are finally ready for winter. The next spring the stored nutrients and sugars will power the burst of new leaves and branches! This non-native Norway Maple (Acer platanoides) is extracting the green chlorophyll from its leaves and storing it in the roots for next spring’s leaves. SOME ADULT TREES KEEP A CHECK ON THE YOUNG. Older oaks and beeches create a lot of shade that inhibits the rapid growth of younger trees. You’d think that would be a problem for the little trees, but at least for oaks and beeches, it isn’t. The older tree is still feeding the younger through the underground web, so the sapling can survive without as much sunlight and its wood. According to Wohlleben, this slower, denser growth makes saplings more resistant to fungi and insects. The adult’s canopy may also protect the saplings from heavy spring frosts. When a gap develops in the canopy, the sapling is ready to grow. Biological child care, you might say. Large trees shade saplings. That way they grow more slowly but have denser wood to resist disease and insects. SOME YOUNG TREES TAKE ADVANTAGE OF “SLEEPING” ADULTS. Once larger trees shed their autumn leaves and “sleep” for the winter, the youngsters seize the moment! Many keep their leaves later into the fall so they can make more sugars from the autumn sunlight available under the bare adult trees. Young trees also “wake” on average about two weeks earlier than older trees. That gives them a little extra spring sunlight for growth. The youngsters can get caught, though, by an early freeze, preventing them from shedding their leaves. That’s not a huge problem for little trees in the winter, which are more flexible in winter wind and snow. Smaller trees may also keep their leaves to discourage deer and other herbivores from nibbling their twigs and bark – who wants a mouthful of lifeless leaves? This old White Oak (Quercus alba) lost its leaves in the fall but the sapling nearby kept its leaves to take advantage of late fall light. Wohlleben reports that tree lovers experimented with taking tiny oaks inside in pots on windowsills during the winter. The result was that the seedlings, taking advantage of the heat and light, continued to grow all winter. But without a rest from all that growing, most of them died during their first year. 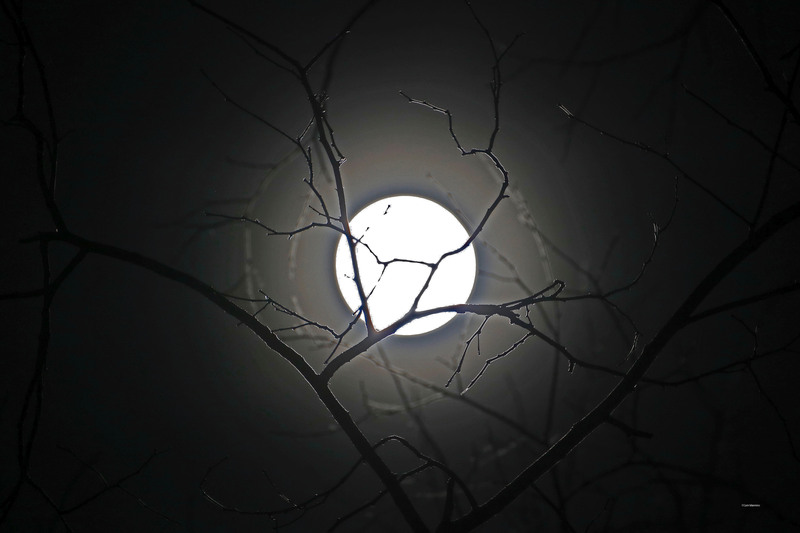 Trees may need rest at night too, when the air cools and their metabolism slows. Sleep deprivation – evidently it’s a problem for both humans and trees! Trees may benefit from a bit of a rest at night and during the winter just as we do. Needles are actually the leaves of conifers. Their leaves survive short summers and harsh winters by being tightly rolled into needles and by “bundling up” with a waxy coating on their bark and needles that acts like anti-freeze and helps retains moisture. Green needles allow conifers to start photosynthesizing as soon as the weather warms. Like us human Michiganders, they soak up as much sunshine as possible when spring arrives. 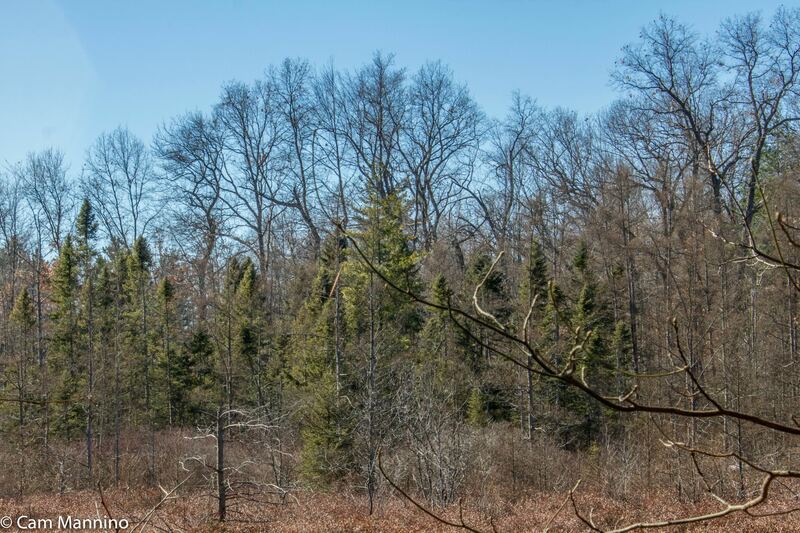 In a bog near Lost Lake Nature Park is a remnant stand of Black Spruce (Picea mariana). These trees typically grow in colder environments and would have populated large areas of Michigan as the glaciers retreated. The cool bog microclimate provides a southern refuge for black spruce. Their sparse, pointed tops and flexible branches, which layer downward when snow-laden, shed snow nicely too, an important survival strategy in snowy climes. A remnant stand of Black Spruce near Lost Lake Park, trees that thrived in the cool climate as the glaciers receded. AGE AFFECTS TREES IN WAYS SIMILAR TO AGE IN HUMANS. Bark is essentially the skin of a tree. 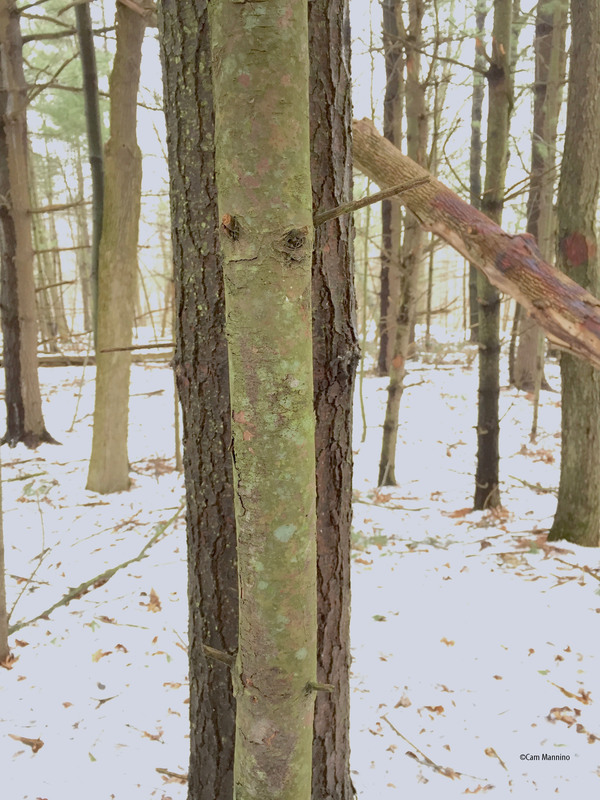 It holds in and releases moisture, protects a tree’s “insides” and is a barrier against pathogens that seek their way into the circulatory system. According to Wohlleben, “In young trees of all species, the outer bark is smooth as a baby’s bottom. As trees age, wrinkles gradually appear (beginning from below) – and they steadily deepen as the years progress.” Their girth, of course, increases, too. The crowns of trees thin out with age, just like the locks of aging humans. So we’re not the only ones who get stouter, balder and more wrinkled with age! The young White Pine (Pinus strobus) has smooth skin, or bark, like all saplings, whereas the adult pine behind has “wrinkled” bark. 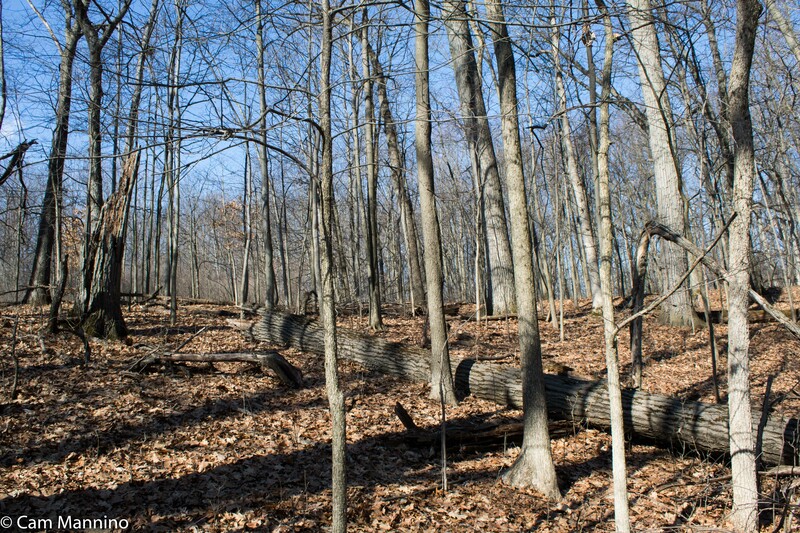 Wohlleben says that “In total, a fifth of all animal and plant species – that’s about six thousand of the species we know about – depend on dead wood.” Insect and fungus specialists process a fallen log over many years, and woodpeckers, salamanders, and other critters find food and refuge in the rotting wood. Nutrients stored in bark and wood for perhaps hundreds of years are slowly returned to the forest floor. In some cases, young trees even sprout in the fallen bodies of their elders, creating “nurse-logs.” Trees, like humans, leave a legacy for future generations. Insects and fungi will gradually process this fallen tree, returning nutrients that will feed the whole forest, including new saplings. A tree legacy. 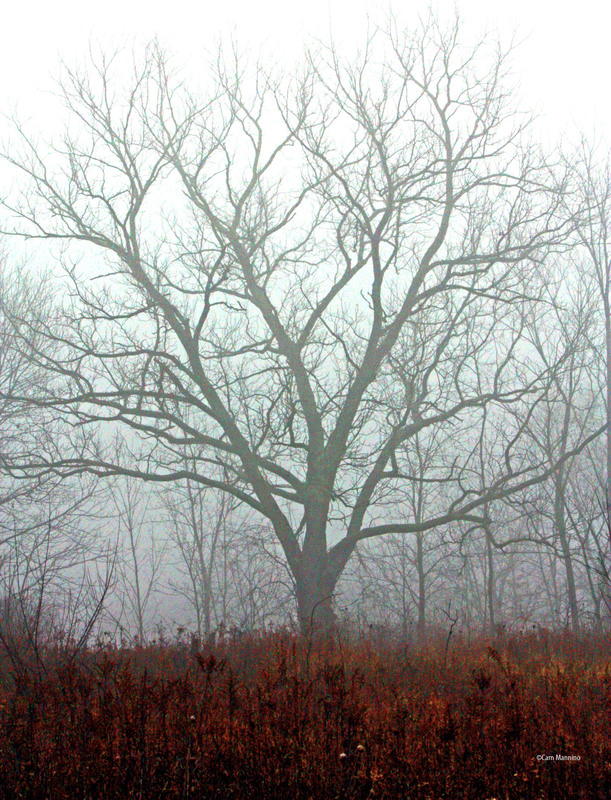 Black Walnut (Juglans nigra) on a foggy autumn morning at Bear Creek. Without faces, it’s easy to see trees as “things” instead of living, breathing beings. They can become just a backdrop to our lives. But trees communicate with each other, feed their young, breathe – do so many of things that we do. 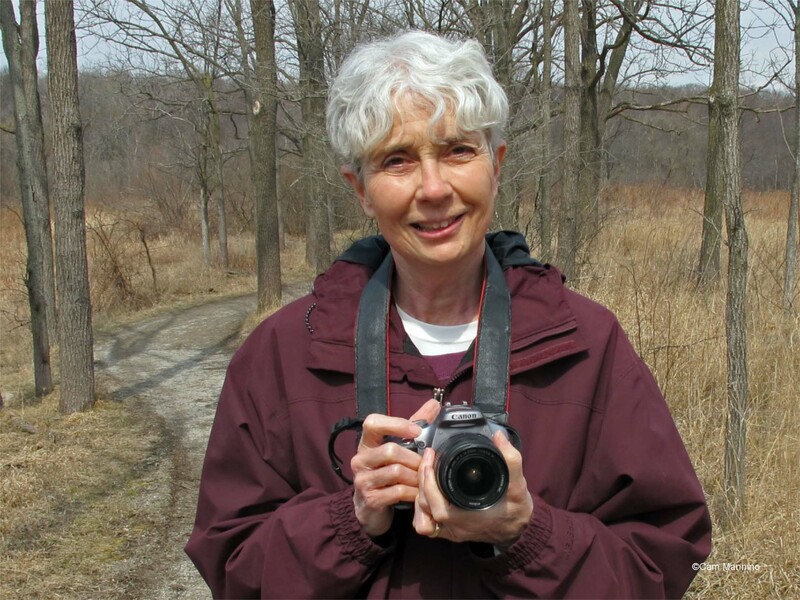 Wohlleben’s book helped me see trees in a new and more complex light, even though I’ve always loved trees. I hope this brief taste of what the book has to offer does the same for you. Footnote: The main source for this blog was The Hidden Life of Trees:  What They Feel, How They Communicate by Peter Wohlleben, Copyright 2015 by Ludwig Verlag, Munich, part of Random House GmbH publishing group. English translation copyright 2016 by Jane Billinghurst . Other sources include Wikipedia, www.Michiganflora.net, Trees in My Forest by Bernd Heinrich (Cliff Street Books, 1997) and Dr. Ben VanderWeide, Natural Areas Stewardship Manager for Oakland Townships Park and Recreation.